970 While The Gettin’s Good. They had some of the new Ninja Turtle toys at the store today. Try though I might I couldn’t resist getting one. Donatello is my turtle of choice in situations where I must choose a single brother. I really like the style of these figures. Well, the turtles at any rate. I’m not thrilled with the design of Splinter, and April looks a little odd. Shredder looks about the same as his last incarnaton, but the figure has weird eye placement. Maybe it was just the one I saw, but his face looked melty. The Foot soldiers looks pretty punchable. Kraang is a lot more science fictiony than older versions. I didn’t get a real good look at it, but he seems to be set permanently in his robot suit. His “arms” are floppy, which I thought was a nice touch. I saw almost no episodes of the first cartoon, so I had no idea who Kraang was when I was a kid. Not for a long time anyway. Eventually I saw enough to understand what his deal was. I was a fan of a few of the comics I got to read and the live action movie. Which didn’t feature a lot of the stuff that most TMNT fans expect from every incarnation. The looks of the show is more flat seeming than the toys represent. They’re kind of like if you took the time to render the show’s art style more completely. At least as far as I can tell. I’ve only seen preview clips at this point. More than anything else what makes these new toys better than the old ones, right up to the last ones I remember being available, is articulation. You can actually pose these guys in more than one way. Every tutrtle toy I’ve ever had have basically been statues with joints stuck on after the fact. The arms only look right one way, and the legs only stand one way, if at all. These ones have big, stable, feet and actual joints that can be manipulated into many positions. 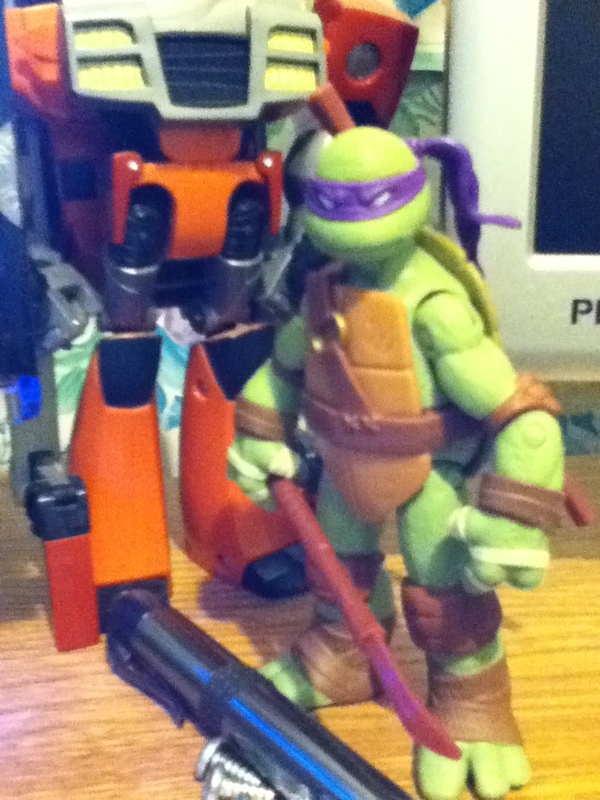 Donatello’s stick seems oddly short though. I don’t know if it’s short in the show, or they made it that way for safety reasons, but it’s just a little weird. It seems like it should be longer. I agree with all of the above. Reggie is just blinded by his own ego. First of all… Really? Is she really starting to like Reggie now? What happened to wanting to ride Ed like a Quidditch broom, or something. Also, in an unrelated topic, I dont recall Donatello ever having a blade at the end of his staff. Whats with the new toys? She’s not Like liking Reggie. She just wants him to change like she did without getting hurt. DINGDINGDING! heeeeyoooo! You win the price of apt insight and reading comprehension! how do you feel!? We don’t get much info here at Air Base Itsuckssobad, Afghanistan, but wha? I’ve seen bo staff type weapons with a blade at the end before, so okay…I guess. But nunchaku with blades??? Plus…it’s Mikey!!! Who wants to give him an edged weapon?! Belief in a cause! Shepherd Book would be proud. Leo was always my choice. In fact, it was cuz of him that I took Kendo (Japanese sword-fighting martial art; literal translation “Way of the Sword”) when I was younger. The bo staff, nunchaku, and sai were all cool…but the katana was BA! I was a huge fan of ’80s cartoon growing up, as campy as it was. I still don’t like the eyes without pupils…just feels off to me. All of the vehicles that they made back then for the Turtles were pretty cool, but none of the turtles really fit inside them…was always kind of a bummer. Is Nina going to make Reggie her new project like Carol is working on Mike? Could be kinda interesting. Nina’s humanity lesson FTW! I actually have a copy of the TMNT board and dice RPG, that was created in their early days, several years before the cartoon. Guess I better drop this. I like the new turtle toys. All the toys but the turtles have crap articulation, though. It’s a source of consternation for the fans. Krang (Kraang now)in the new series is a race– there’s not just one. I wonder how that is? I used to love watching his episodes. He almost became comic relief sometimes because, take him out of his ridiculous suit or threaten it too much, and he’s just a big squishy wet ball. I’m guessing it’s drawing from the original comics on that one, rather than the old cartoons (which changed… a lot.. from the original comics). In the comic there was an alien race that looked like Krang (but wasn’t called Krang), and was more of a neutral plot device than a villain faction. The cartoon basically created it’s own entirely new villain which “borrowed” its character model design of the comic book aliens. Interesting. I would have expected Reggie to be prideful about not taking the prize he didn’t win, but there’s something even better about just admitting to what he wants. It’s something I can’t pull off myself. … which makes me worse at something than Reggie. Reggie – two words: Shut. Up. Cheers to Donatello. He was my always my favorite. 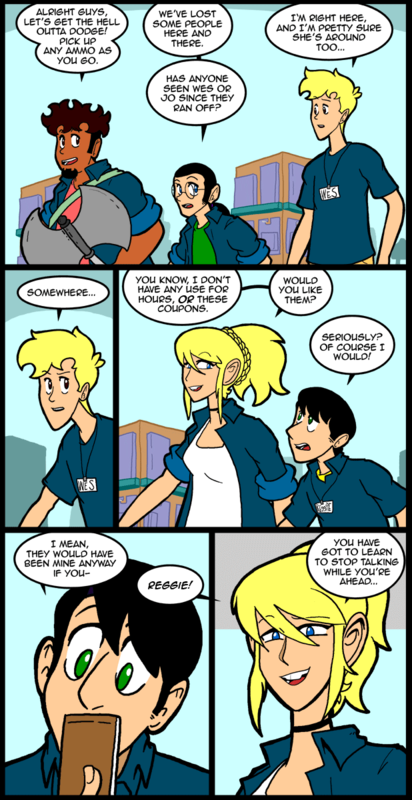 This story arc has started making me question my Ed/Nina thoughts… I sorta want Nina to get with Reggie now… Or maybe I just had a rough lunch.